That's right, folks! Don't wait to get that special geek or nerd what their heart desires. Someone else may snag it! Wednesday thru Friday basic 15% off with exceptions and the discounts increase the closer to the holidays. But do you dare wait to get a better deal? OH, THE HUMANITY! We, also, have gift certificates in any denomination over $5. Again, the sale runs today Wednesday 12/16/2015 thru Christmas Eve 12/24/2015 at 5pm. 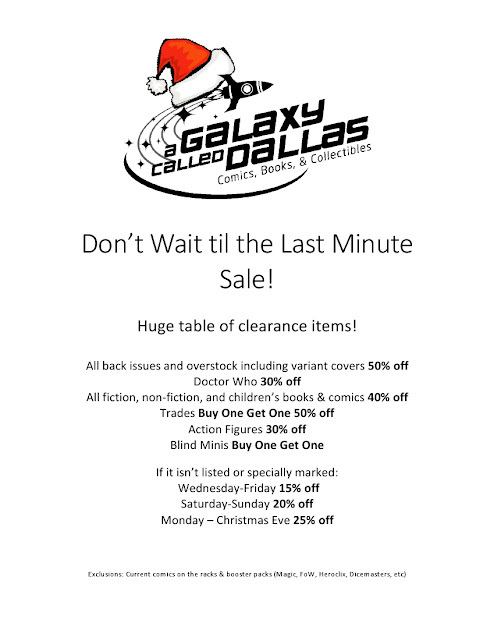 Our Christmas store hours are open Christmas Eve until 5pm, closed Christmas Day, and back in business on Saturday. For new shoppers, A Galaxy Called Dallas is located on the southwest corner of Belt Line Rd. and North Garland Ave. at 1238 Belt Line Rd. #365. Our phone number is 972-530-2600.